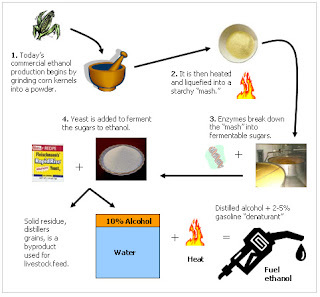 The production of ethanol today involves the use of yeast to convert sugar into alcohol – the same fermentation process that has been used for thousands of years, although on a much larger scale. 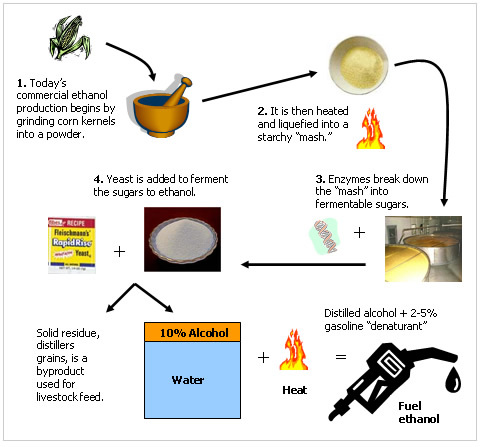 A typical dry mill production facility produces 50 to 100 million gallons of ethanol a year; the process is shown below. Dry-mill production also results in solid byproducts known as distillers grains and solubles (DGS), which can be dried and used to feed livestock. In some plants close to cattle feedlots, the grains can be fed wet to livestock, avoiding the need for drying and saving both energy and money. The wet-mill process, which begins by soaking the grain in water and acid, generally produces corn oil, corn gluten meal (to feed poultry), and sweeteners in addition to ethanol. Wet mills tend to be much larger than dry mills. As of February 2007, the ethanol production capacity of the United States was estimated at 5.6 billion gallons per year. An additional capacity of 6.2 billion gallons per year was under construction, which will bring the total capacity to 11.8 billion gallons per year spread across 23 states. Corn represents roughly 95% of the feedstocks used in those facilities. The corn used for ethanol production is field corn typically used to feed livestock, not the sweet corn marketed for human consumption. Nearly 40% of the nation’s ethanol production capacity is farmer-owned. Ethanol is a high-octane premium fuel. It improves engine performance and prevents “knock.” A blend of 10% ethanol and 90% gasoline, or E10, is approved for use in every vehicle sold in the U.S.; about one-third of America’s gasoline contains some ethanol. In the past, this blend has been called gasohol. Ethanol can also be used as a substitute for gasoline. In the U.S. it is sold in blends of up to 85% (E85). Gasoline, the remaining 15%, is needed to help the fuel ignite in cold weather. In very cold weather, higher proportions of gasoline may be needed. Ethanol at these higher blends should not be used in conventional vehicles but only in flexible fuel vehicles (FFVs), which are designed to run on any combination of ethanol and gasoline up to E85. Ethanol will become standard in Indy race cars in 2007, replacing another alcohol – methanol. The higher octane of alcohols (compared to gasoline) allows engines to be set at a higher compression ratio, increasing the car’s performance. The U.S. consumes a little more than 20 million barrels of oil a day. The largest end uses are motor gasoline (9 million barrels) and diesel (4 million barrels). That works out to about 140 billion gallons of gasoline and 60 billion gallons of diesel a year. In 2006, the U.S. consumed nearly 5.4 billion gallons of ethanol, 12 percent of which was imported. Adjusting for its lower energy content, that amounted to about 2.5% of the total U.S. demand for gasoline. Biodiesel consumption was much lower, about 250 million gallons in 2006. In the Energy Policy Act of 2005, Congress enacted the Renewable Fuels Standard, which requires an annual increase in biofuels use to 7.5 billion gallons by 2012. The chart above details past levels of U.S. ethanol production and the minimum levels set by the Renewable Fuels Standard. The two largest variables in the cost of ethanol are the cost of corn and the cost of natural gas or other sources of heat needed to process the mixture. When corn costs $2 a bushel, it costs between $1 and $1.20 to make a gallon of ethanol. Because ethanol has only two-thirds the energy content of gasoline, that’s equivalent to $1.50-$1.80 per gallon of gasoline (wholesale), or $50-$60 per barrel of oil. At that price of corn, ethanol is competitive with gasoline with the current subsidy for gasoline blenders when oil costs $30 a barrel or more. It is economically competitive with gasoline without a subsidy when oil costs $50 a barrel or more. It takes a little more than a third of a bushel of corn to make a gallon of ethanol, so, if the cost of corn rises from $2 to $3 a bushel, that adds about 35 cents to the cost of a gallon of ethanol. At $1.50 a gallon, ethanol competes with gasoline without a subsidy when oil costs $70 a barrel or more. Corn prices spiked upward at the end of 2006 and reached $4 per bushel, but it remains to be seen if that is a temporary phenomenon. In 2006, crude oil prices ranged from $54 to $74, and wholesale gasoline prices ranged from $1.87 to $2.46 a gallon as retail gasoline prices ranged from $2.28 to $3.08 a gallon. 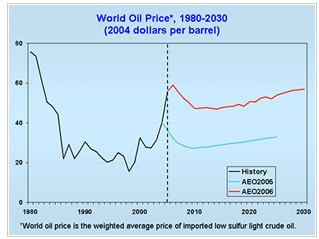 In the 2006 Annual Energy Outlook, the U.S. Energy Information Administration increased its oil price forecast by $20 a barrel over the next 20 years, relative to its prior-year forecast, as the chart below shows. The price is now not projected to fall below $49.64 during that time. The red line on top shows the higher oil prices contained in the 2006 Annual Energy Outlook, compared to the 2005 forecast in blue. It is important to note that the market price of ethanol does not always reflect the cost of production. As oil refiners abandoned the substitute MTBE in 2006, ethanol demand increased. Ethanol prices rose to match or exceed gasoline prices without any major changes in production costs (although corn prices rose late in the year). In addition, most ethanol is sold under long-term contracts, so the spot price of ethanol may not represent typical transactions. Ethanol prices are expected to decline with the increase in production capacity and the accompanying competition. The federal government provides a tax incentive to gasoline blenders (not ethanol producers) to encourage the use of ethanol. This subsidy affects how ethanol’s competitiveness with gasoline. For example, gasoline blends containing 10% ethanol earn a tax credit of 5.1 cents per gallon. In effect, the blenders can pay up to 51 cents more for a gallon of ethanol than the equivalent amount of gasoline and still break even. This tax break is called the Volumetric Ethanol Excise Tax Credit. Its cost to the government ($2.5 billion in 2006) is offset by savings in crop payments to farmers. In 2006 high corn prices caused by ethanol demand reduced farm support payments by roughly $6 billion. A tariff of 54 cents a gallon is imposed on most foreign ethanol. The tariff is meant to counterbalance the ethanol tax credit and ensure that foreign producers are not subsidized. Significant exemptions were created by the Central America Free Trade Agreement. 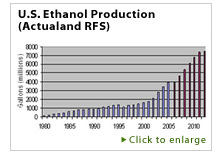 More than 700 million gallons of ethanol were imported in 2006, a five-fold increase from 2005. Some states do pay production subsidies directly to ethanol producers, but the federal tax credit for ethanol is paid to gasoline blenders, not ethanol producers. Small producers receive an additional production income tax credit of 10 cents per gallon on up to 15 million gallons of production annually. Animals consumed most of the corn produced in the U.S. in 2005 – 54.5% of 11 billion bushels. The rest went to exports (18.2%), ethanol (14.7%), and domestic food consumption (12.4%). 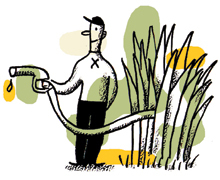 Every gallon of ethanol requires a small amount of petroleum, mostly for farming. The equivalent of 5-8% of the energy in ethanol goes to such uses as diesel for farm tractors, fuel to ship corn to a processing plant, and more fuel to ship the finished ethanol to a pump. Most of the energy used at a processing plant comes from natural gas or coal. Thus, ethanol is highly effective at displacing oil; just one gallon of oil is required to make 12-20 gallons of ethanol. On this point, it makes little difference whether the ethanol is made from corn, sugar cane, or cellulose. The term “energy balance” refers to the difference between the amount of fossil energy needed to produce a fuel and the energy the fuel contains. It takes energy to transform any product from one form into another. (For example, electricity contains less than 40% of the energy of the coal used to make it. ) 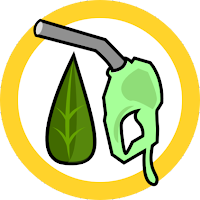 For every unit of energy delivered at the pump, corn ethanol requires 0.76 units of fossil energy, and gasoline requires 1.22 units. The use of ethanol thus results in the consumption of 40% less fossil energy than the gasoline it replaces. Papers by a Cornell entomologist and a Berkeley petroleum geologist have asserted a more negative view of ethanol and have received much attention – but their methodology has been disputed by their peers. Solar Auto-That Charges On Petrol !